The nine judges had an unenviable task in room 505 of 41 Cooper Square. 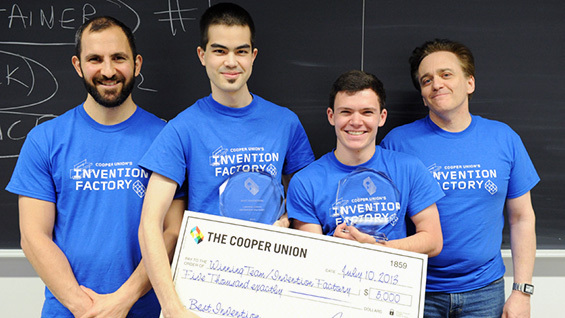 On July 10 they convened for the final round of The Cooper Union's first-ever "Invention Factory" to decide which of ten hopefully patentable, student-created inventions would win the grand prize of $5,000. After five and a half weeks of daily six-hour classroom work that inspired additional nights and weekends of laser cutting, 3D printing and assembling, it came down to this. Over the course of two hours the 19 inventors presented their fully prototyped ideas, each one of which ingeniously solves a real-world problem or otherwise improves existing ideas. During the presentations one repeatedly asked oneself: "where was this when I needed it?" Picking the best would not be an easy decision. Conceived by Acting Dean Alan Wolf, who is also a patent attorney, and co-organized by Eric Lima, Assistant Professor of Mechanical Engineering, the Invention Factory aims to teach current students, "how to invent and how to protect their intellectual property," Dean Wolf says. Funding came from the Edward Durbin and Joan Morris Innovation Fund for the Albert Nerken School of Engineering, a gift of Ed Durbin (EE'48.) 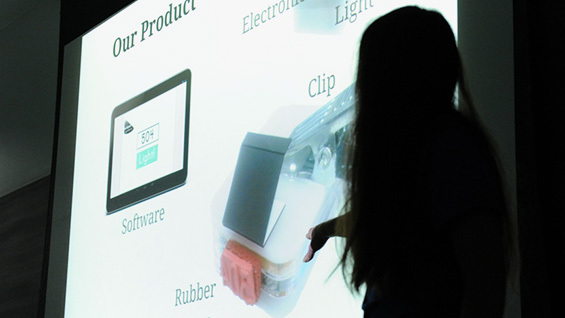 Over an intensive five weeks students had to conceive of an idea, have it approved by the other participants via anonymous vote, research any prior patents or products that would preclude patenting the idea themselves and build a working prototype. During the five weeks they repeatedly presented their idea to a series of guest evaluators who asked tough questions about its marketability as much as its engineering. 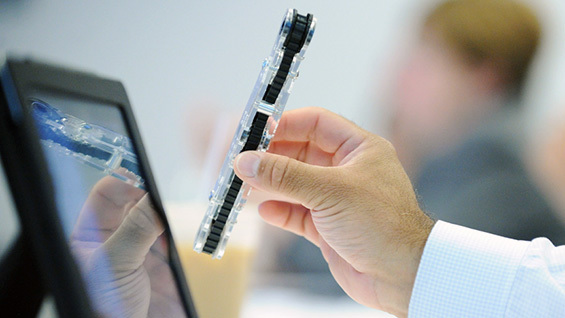 By the end all participants had to file a provisional patent application on their invention. The most promising ideas may be further developed through the C.V. Starr Research Foundation, Cooper Union's primary research arm, potentially becoming a revenue stream for the institution. The resulting inventions certainly all seem promising. Among those presented were a device to improve bicycle safety by creating a bright "halo" on the ground around the bike using LEDs built into the pedals, a hand-sanitizing device activated by the act of opening a door, a multi-tool for arthritis sufferers, an umbrella air-dryer and sealable plastic baggies that you can write on and stick anywhere. After seeing ten presentations, the judges, who included Susan Englehardt, Executive Director of the Rutgers University Center for Innovative Ventures of Emerging Technology, Zack Yorke, Designer at Google Creative Lab and Barry Negrin (ME'89), a patent attorney, conferred while the young inventors patiently waited in the hallway. During the deliberations Dean Wolf popped out to say they were all "very impressed." Then the students filed in and learned of the winning inventions. A device born of the frustrations of an impossible-to-reach bolt on the Cooper Union Formula One racecar, the inventors demonstrated that the wrench could place, thread and tighten a nut in the smallest of spaces. One end of the wrench holds the nut while the other end, when turned, drives a belt inside the wrench causing the nut to turn as well. Alyssa Davis, whose work in Africa we previously profiled, based the improved system of checking coats on her four years doing exactly that at The Bowery Hotel just a few blocks away. The system uses invisible-ink arm stamps of unique three digit numbers instead of loseable tickets. When the person wants their belongings their unique number gets read into a tablet or laptop that wirelessly triggers a flashing light affixed to the checked articles. The flashing instantly identifies the belongings amidst a sea of similar-looking things and eliminates the need for checked items to be kept in any sort of order. The winning team received a trophy inside a blue box. 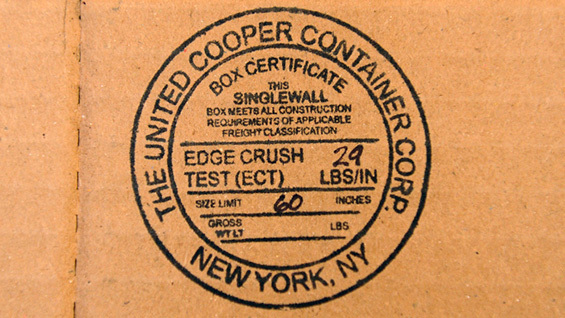 Chris Curro jokingly complained of the difficulty in opening it. Afterwards, President Bharucha, who watched all the presentations but declined to be a judge, spoke to the gathered crowd, saying, "This has been the most mind-blowing thing I have seen. A lot schools have this for faculty but not for students. It will make Cooper Union even more unique. I'm very proud of all of you." While the inventions may or may not ever come to market, a series of thank-you notes sent to the organizers of the Invention Factory revealed the program's real value. "I really enjoyed having the chance to apply engineering concepts that I've been learning in class to real-life experience," wrote Jonathan Zorko, "The experience of facing and speaking before a panel of judges was also invaluable." A note from Gavin Kaplan reads, "It was a fantastic experience. I learned a great deal about patenting and presenting in the real world, which will be of great use to me in the future." Andrey Kovalev also wrote to say, "…I learned about patents and how to make an invention. But most importantly, I learned a life lesson: there is really nothing stopping us from going out and inventing."